Identifications. Before 2000, identifications were mostly made by Wayne Cokeley (then chair of the Borough's Environmental Commission) and Rod Tulloss (also former chair of the Environmental Commission). Expert assistance was sought with regard to Sphagnum, certain hepatics, certain ferns and fern allies, grasses, reeds, and sedges. Between March and October, 2000, Karl Andersen (Rancocas Nature Center, New Jersey Audubon Society) and Linda Kelly lent their valuable assistance to a plant survey of the borough. Their site visits were on the following dates: March 31; April 24 & 27; May 4 & 26; June 2, 9, & 14; August 6; and September 30. They reconfirmed 72% of the species on the original list, added 216 species to the list, and recommended removal of 31 previously listed species (mostly because they were horticultural introductions). We are also greatful to the Borough's Environmental Consultant, Sven Hoeger (Creative Habitat Corp.), for his valuable comments, suggestions, corrections, and new identifications. The list now contains names of more than 430 plants reported to occur in Roosevelt. The Borough of Roosevelt and the Fund for Roosevelt, Inc. extend their sincere thanks to Karl and Linda. Missing authorial citation is indicated by "__". Rare, threatened, and endangered taxa. Taxa listed in these categories in New Jersey are marked (respectively) with R, T, and E.
Exotics, etc. Exotics are marked with an asterisk (*). Plants native to eastern North America, but introduced regionally are marked with an at-symbol (@). Introduced plants that are particularly invasive are marked with a bold face, red "i." For selected links leading to more information about invasive plants and their control, click here. Images. Images are available from a separate list as well as from occasional "hot" entries on this page. Return to Natural Resources Page. Plagiochila asplenoides (L.) Dum. subsp. porelloides (Torrey ex Nees) Schust. Brachythecium cf. velutinum (Hedw.) B.S.G. Note: Of 33 taxa in this list, 32 have been confirmed since 1 January 1999. Many are illustrated in these pages. One additional taxon (marked by "?") is presumed present because hybrids have been found. The parent species is known to occur in the area according to Montgomery and Fairbrothers (1992), but has not been reported from Roosevelt to our knowledge. The species not confirmed since 1 January 1999 is marked with an ampersand ("&"). An "at sign" ("@") means a plant is native to the area, but the known exemplar(s) were re-introduced to the wild. Potentially invasive, but contained at present. Pteridium aquilinum (L.) Kuhn var. 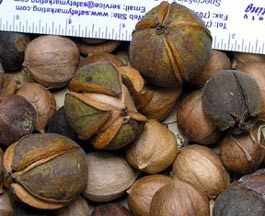 latiusculum (Desv.) Underw. Athyrium filix-femina (L.) Roth ex Mertens var. asplenoides (Michx.) Farw. E@ Lygodium palmatum (Bernh.) Sw. Illustrated at top of this page. Note: Taxa in this section are arranged by family. Families are presented in alphabetical order without regard to taxonomic relationship. Where wildfires are prevented, this tree can crowd out others. Containment recommended via woodlot management. Removal from areas adjacent to forest recommended. Containment/removal on public lands recommended. Recommended for removal; must be pulled year after year. Recommended for removal from public lands. 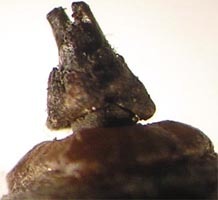 Magnified image of acorn tip with "spear point," F1, above. Morella pensylvanica (Mirbel) Kartesz comb. prov. * Picea abies (L.) Karst. @ Tsuga canadensis (L.) Carr. * i Rosa multiflora Thunb. * i Vinca minor L.
Recommended for removal from land adjacent to, or in, forests and wetlands. *i Cirsium arvense (L.) Scop. Solidago canadensis var. scabra T. & G.
Recommended for removal. Probably impossible to extirpate. @ Mertensia virginica (L.) Pers. * Barbarea vulgaris R. Br. * Lepidium campestre (L.) R. Br. * Sisymbrium officinale (L.) Scop. Recommended for removal; may be impossible to extirpate. * Ipomoea hederacea (L.) Jacq. * i Euphorbia cyparissias L.
* i Coronilla varia L.
Recommended for control or removal, but caution must be exercised where the plant has been introduced to control erosion..
* Lespedeza striata (Thunb.) D. & A. Recommended for removal; probably impossible to extirpate. * i Lamium purpureum L.
* i Convallaria majalis L.
Recommended for removal/extirpation from public lands. Recommended for extirpation, requires aggressive control. Getting out of control in Assunpink Wildlife Management Area nearby. R Tipularia discolor (Pursh) Nutt. * i Plantago lanceolata L.
* i Plantago major L.
*i Polygonum cuspidatum Siebold & Zuccar. * Eranthus hyemalis (L.) Salisb. Agalinis tenuifolia (M. Vahl) Raf. 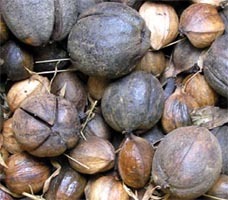 Once established, produces quantities of seed, difficult to remove. Recommended for removal. Originally created by Wayne Cokeley. 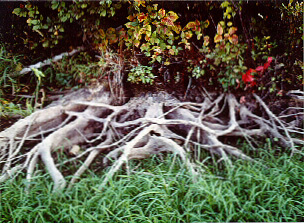 Maintained by R. E. Tulloss. Copyright 1999, 2000, 2001, 2002, 2005, 2008, 2009, 2011 by Fund for Roosevelt, Inc.